Northern Cyprus officially the Turkish Republic of Northern Cyprus (Turkish: Kuzey Kıbrıs Türk Cumhuriyeti) (TRNC), is a partially recognised country in the northern third of the island of Cyprus. Three hundred thousand people live in its 3,335 km². Turkey is the only country which recognizes the territory as an independent republic. Cyprus was conquered and became part of the Ottoman Empire from 1570–1914. Many Turks became settlers. As the Ottoman Empire sided against the British empire in World War I, the British annexed Cyprus. In 1923 by the treaty of Lausanne Turkey gave up the island to the British Empire which in 1925 converted it to a crown colony. The British administered it from 1878 until 1960. In 1974 some of the Greek Army supported a coup against the Archbishop and President Makarios. The Turkish army invaded Cyprus. This had the effect that over two hundred thousand Greek and Turkish Cypriots abandoned their homes and become refugees in the other part of their own country. Many settlers from mainland Turkey came from Turkey into the occupied part of the island. Some native Turkish Cypriots left the occupied part to find a better life in the U.K and other countries. As the Turkish army stayed the possibility of a negotiated settlement became nearly impossible. 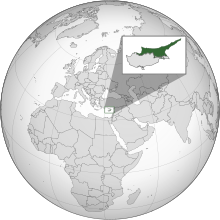 The Turkish Republic of Northern Cyprus was formed in 1983. Negotiations for a unified island have been held several times without success. The standard of living in the Turkish Republic of Northern Cyprus is lower than in the Republic of Cyprus. ↑ 1.0 1.1 1.2 "KKTC". Turkish Ministry of Economy. Retrieved 28 July 2015. This page was last changed on 18 April 2019, at 10:38.